The new year is bringing a new look and feel to the MiraCosta Community College District's San Elijo campus. 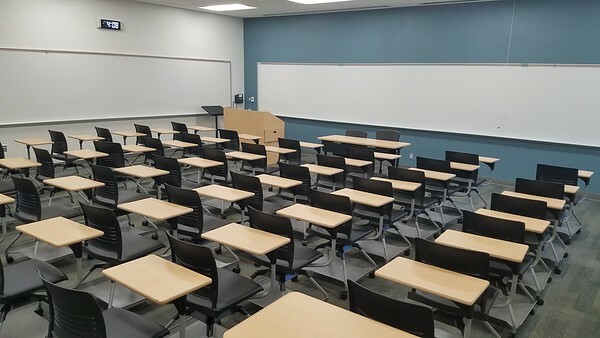 A major renovation and modernization of the campus’ Building 600 – one of the main instructional buildings at San Elijo – is opening for the Spring 2019 semester. It is the first facility on the campus to be modernized under the district’s $455 million Measure MM bond, approved by voters in November 2016. The building’s electrical, mechanical, and plumbing systems were fully upgraded. Ceilings were upgraded and the roof completely retiled. Restrooms were also gutted and fully upgraded with high-efficiency fixtures. The building is approximately 5,295 gross square feet, and includes classrooms used for a wide range of English, humanities, and social sciences classes required for students to complete university transfer requirements. “I think that, outside of the dramatic aesthetic changes, students and staff and faculty are going to really appreciate the technical improvements and having access to high-speed internet,” added Macias. The $2.2 million project also included ADA and public safety enhancements, including new paving, new hardscape and landscaping. The project architect was Architects Mosher Drew and Conan Construction served as the general contractor on the project. Kitchell is the construction and Measure MM bond program manager. The Facilities Master Plan for the San Elijo Campus outlines the renovation and modernization of the existing facilities to provide flexible and interactive 21st century learning environments. Buildings 200, 300, 400 and 500 are in line for improvements to be funded by Bond Measure MM. A new Student Services and Administration Building will address identified space deficits and provide a new identity to the campus. Site improvement projects include new outdoor learning spaces, water-conscious landscaping, and infrastructure repair. Construction of the building is slated to begin in October.